Buy and print postage for eBay shipments right from your Auctiva account! Save money and time with Integrated Shipping at Auctiva! Create USPS labels for all your eBay shipments, easily and more cost-effectively, using our new Integrated Shipping feature. Convenient. 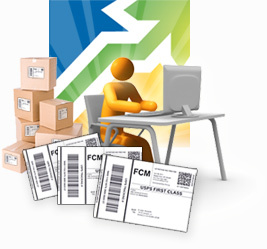 Buy & print postage labels without ever leaving Auctiva.com. Affordable. Our rates are cheaper than the post office. No hidden costs. Pay only for the postage you buy—no need to subscribe to an external postage provider. Flexible. Most USPS domestic and international services are available, including First Class International, Priority and Express. Sign up with Auctiva today to take advantage of this time- and money-saving feature.